Our thanks to Paul Drew and Sam Hale for this EXCLUSIVE REELRADIO article and aircheck. Thanks also to Rob Frankel for restoring the music to this classic recording.
. . . here at the yawn of a new day . . . I am blessed. Dr. Don Rose and Kae entered my life and career in 1966. We were WQXI Top 40 jocks for PD Red Jones. Red did morning drive. I was evenings until Kent Burkhart promoted me to PD. Insecure, one of my first moves was to release Red, move Dr. Don to go up against the giant WSB morning share, replacing myself on the air with Bob Todd. In no time, Dr. Don was taking listeners away from WSB. In early 1967, RKO offered me the CKLW PD job and I accepted it, and it got better that summer with Drake/Chenault consulting. 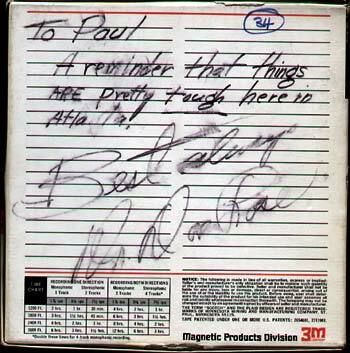 This is the tape box sent to Paul Drew that contained the 7-inch reel recording of Dr. Don Rose on WQXI, February 28, 1967, which is presented in this exhibit. Don called me at CKLW, asking my advice. WFIL was offering him mornings, at $15,000 a year. I suggested he ask for $20,000. But, I also told him that I didn't "think his cornball humor would go over in Philadelphia." He took the WFIL morning job. When I arrived to "fix" WIBG for Storer in April of 1968, Dr. Don and PD Jim Hilliard handed me my head. In early 1973, Bruce Johnson, RKO Radio's new President, contacted me to rejoin RKO Radio, entering as KHJ PD. We drove from DC with one collie, through Dallas. KNUS-FM sounded great! Within a few weeks, I was head of programming for all the RKO Radio Stations. In Los Angeles, I hired Charlie Van Dyke for mornings. The first RKO GM to call me at KHJ was Pat Norman from KFRC. I told him, "Hire the KNUS PD, whoever he is". To my surprise, he was Ted Atkins' mid-day jock at CKLW when I was there a second time as PD. He left to be PD for McLendon in Syracuse, switching names from Hal Martin to Michael Spears. That summer, at the Billboard convention in LA, with his cane, Dr. Don approached me. I'd hurt his feelings by not calling him about coming to KHJ mornings. I told Don that I was aware Triangle paid him a full salary for over a year when he wasn't on the air. I had known Jay Cook since his time at WHBQ, I couldn't do something like THAT to Jay. Don told me that WFIL had cut his pay 50%. "Are you telling me, when a morning show opens at one of RKO's major market stations, you would like to be considered?" "Try me", was his response. I had nothing in mind. In the late summer of '73, Chuck Blore walked into my RKO office. He wanted to know if I had ever heard Don Sherwood. I never had, but KFRC staffers from the Bay Area told me many Sherwood stories. I knew KSFO was paying him $35,000 a year to not be on any other bay area radio station. He was by far, the biggest star in radio history there. I asked Blore to leave the tape, and I'd get it back to him. He left, and I was curious. I started listening to it... Corn-ball humor! Then the phone call came from KFRC, telling me they had everything in place, but were missing one key ingredient  the right morning man. I was ready. "Well, guys, I have just the right guy for you. Heard of Don Sherwood? Yes! I have a morning man who'll be even bigger at KFRC than Sherwood ever was when he was on the air. Get hold of Dr. Don Rose at WFIL. He's your one and only choice. Pay whatever it takes." The answer was Yes. The rest is history. The last time I saw Don & Kae, I drove to their home when he wasn't able to get to the station, doing his show from the bedroom. I credit Blore for introducing me to Don Sherwood's air work. Otherwise, I wouldn't have had the confidence to strongly recommend Dr. Don as the ONLY candidate. I knew in advance it would work. Mr. Drew's article and aircheck are for the Exclusive use of REELRADIO.